The Ogopogo is a 218 unit redevelopment project located in a residential / tourist area near the shores of Lake Okanagan in the City of Penticton. 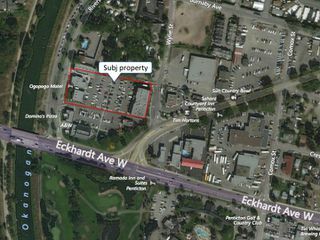 The site is directly across the Street from the Penticton River Channel and parkway and will form part of the North Gateway urban village at the entry to the City from Kelowna and the Coquihalla. 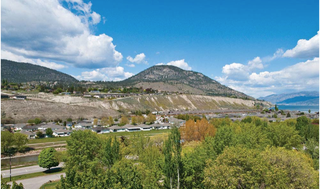 The entire area is very walkable and the site is surrounded by the Penticton Golf Club to the south, the river channel and recreational pathways to the west, the lake to the north, and low-rise residential to the east. Views from the site in these directions illustrate the commanding aspect of these outlooks. The area land uses and zonings are such that these views will be preserved well into the future. A project that will be targeted to retirees, vacation homeowners, and even families, the site has many services nearby. Directly adjacent to the south is a new shopping centre featuring a green grocer, meat market, restaurants, and other services. The lakefront area to the north features a variety of restaurant and recreational opportunities. 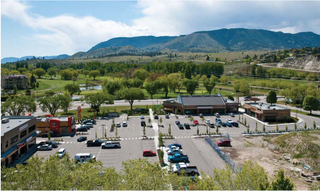 The areas to the east and south have a multitude of highway commercial uses and downtown Penticton is a short drive or bus ride away, with bus service half a block away. The project has a good variety of unit types with 31 townhouse type units and 187 high rise units in two 15 storey towers. 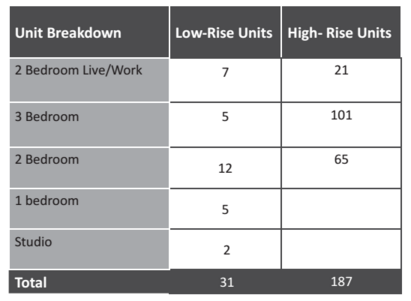 The unit mix is approximately 33% one bedroom, 55% two bedrooms, and 12% three bedrooms. Parking is designed for 1.26 spaces per unit in two levels of parking that are incorporated into the building as partially underground (due to the water table). The parking structure is screened from the outside by ‘wrapping’ the site in townhouses, therefore producing a very positive edge to the project with doors and windows on the streets. This project has been commented upon very favourably by both politicians and citizens alike, and is viewed as a template for design in the City, since the lead architects are the consultants who produced the City’s design guidelines. 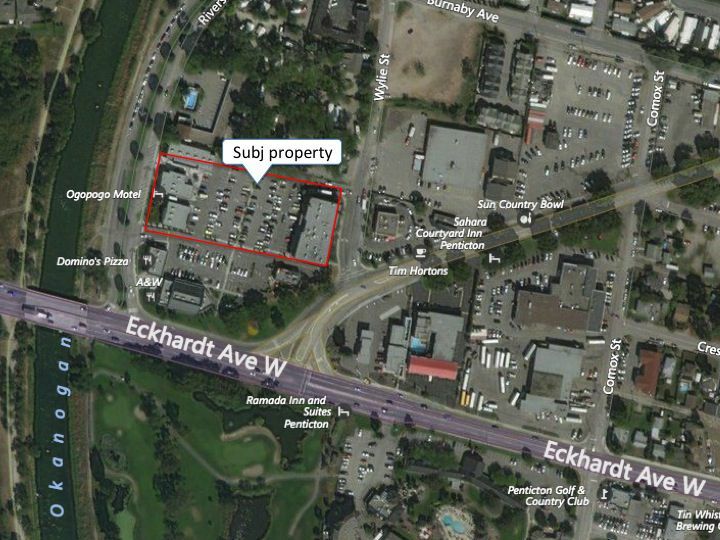 We are confidant that The Ogopogo will become the most sought after multi-family residential address in the City. We look forward to discussions with potential partners in this one of a kind project at the most important gateway to the City of Penticton. The Ogopogo is located at the entry to the City of Penticton in the North Gateway area of the Official Community Plan. As the first portion of the City encountered coming from the Coquihalla or from Kelowna, it commands an important presence. 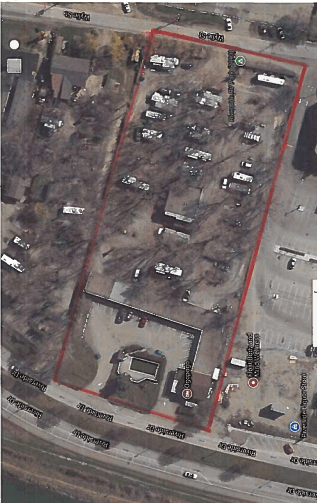 The City has designated this area as an important commercial / tourist area. An “urban village” plan will be undertaken over the next few years, to capitalize on this designation. 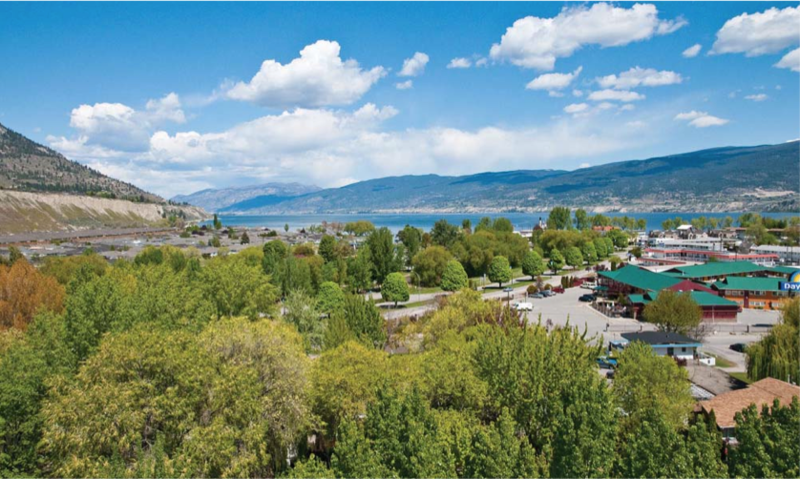 Historically, the area has been an important tourist area with the river channel park, Okanagan lakefront, recreational facilities, and tourist businesses/ accommodations prevalent in the area. Recently, commercial activities have been added with the construction of the Riverside Village Shopping Centre directly adjacent to the project site. Nearby, the South Okanagan Events Centre has been completed and provides a complete range of recreational and convention facilities. The entire area is very walkable, with pedestrian paths along the river linking to the waterfront walkway along Lake Okanagan. The Penticton Golf Club is just south of the project and provides not only the obvious recreational pursuits, but also preserves panoramic views to the south. The Ogopogo is ideally situated for views in all directions, with low rise areas surrounding it. The project itself has been designed to ‘fit’ into the neighbourhood by wrapping the site with townhouses, therefore shielding the parking structure and providing doors and windows on the streets. The townhouses present an urban face similar to highly successful streetfronts developed in places such as Vancouver’s Yaletown. Live / work townhouses on Riverside provide an interesting commercial edge, leading from the shopping centre north to the tourist area along the lakefront. A greenway on the south edge of the site becomes a community amenity that will provide pedestrian connections to the river channel and a buffer to the shopping centre. Above grade gardens will provide the residents with ample private greenspace in addition to individual patios, decks, and roof terraces. 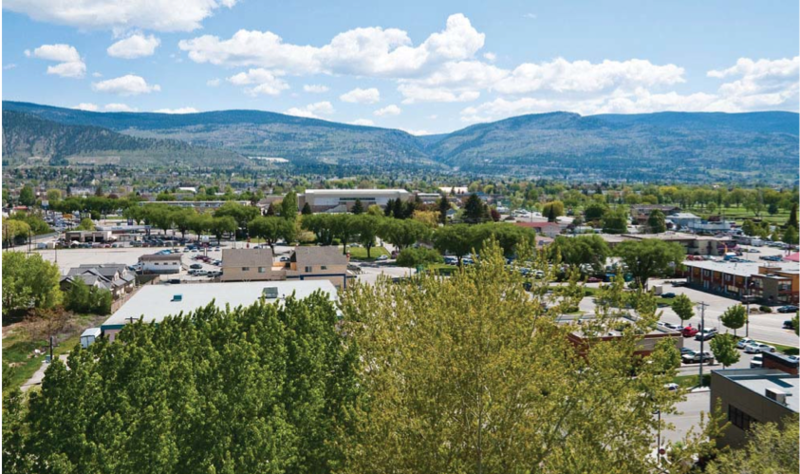 A focus on Crime Prevention through Environmental Design principles and a commitment to providing a LEED quality project shows an intention to produce a project that can meet today’s expectations of Penticton citizens and future residents. The Ogopogo will upgrade the entry to the City through providing a ‘signature development’ anchoring the North Gateway Urban Village. This will be accomplished by using building forms and public realm improvements to provide a walkable and visually inviting neighbourhood, with the Ogopogo at its centre. A primary design feature is the use of the parking plinth as a ‘stepping stone’ that easily demarcates public space and private space through grade changes. By doing so, we also improve the views from the private gardens and lower floors of the towers. The location of the water feature not only anchors an amenity area on the sunny southern side, but locates it in the area of the site where water naturally accumulates, therefore acting as a stormwater retention pond that can be used for irrigation. The western tower is setback from Riverside to not only allow for an indoor / outdoor pool, but also to allow the live /work townhouses on Riverside to have the separate commercial and residential entries as are required. The townhouses are also raised above ground level to meet floodplain requirements and also to provide privacy for the residences. Townhouses on the top of the parking structure allow for luxury units in private garden areas complete with rooftop decks and both northern and southern views. 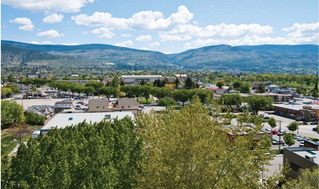 The unit mix provides a variety of accommodation, but focuses on the unit types which have been proven in other developments to be the most in demand for projects of this type in the Okanagan. The unit mix reflects the target market a mix of vacation home buyers, retirees, and primary homeowners. Parking is provided at 1.26 spaces per unit with the probability that 1 space would be assigned to each unit and the remaining 56 spaces available for sale or for visitors / guests.